Advances in technology today have influenced and changed many aspects of our lives. As technology becomes smaller it is able to be used in more and more aspects of our daily lives, competitive and recreational sports are no exception. Borrowing from many disciplines athletes today are clad in space age clothing, ride aerospace and automobile inspired bicycles and use high tech racquets built from composite and other 'high tech' materials. Often accompanying each athlete today are complex watches and heart rate monitors that just a few years ago were the province of only our elite sports academies and athletes. 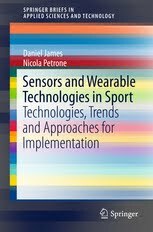 As we enter the age of wireless communications pervading our everyday lives and an unquenchable thirst for information, the dream of small unobtrusive monitoring devices that can quantify every aspect of an athlete’s performance in real time is becoming a reality. One day athletes will no longer need to go to specialist laboratories for performance assessment but instead wear widely available devices during everyday training and perhaps even in competition. Real time feedback has great value in the coaching and training environment and has been greatly facilitated by the advent of low cost wireless technologies. Wireless technologies have advanced considerably in recent years giving rise to many communications protocols that target different balances between throughput, power consumption and complexity. Many of these protocols are open standard whilst many others are vying for market share with competing manufacturers. Wireless networks allow communication between sensor nodes and host systems, which are unable to be networked via traditional wired means. A wireless network of sensor nodes can be deployed quickly and easily, allowing near real time feedback of collected data. A wireless network appropriate for sensing applications must be able to handle the required data throughput, support the required number of nodes and use a minimum amount of power to conserve battery life. Wireless sensor networks that are deployed on mobile objects must be able to cope with temporary data dropouts and must be able to reconfigure the network where appropriate. 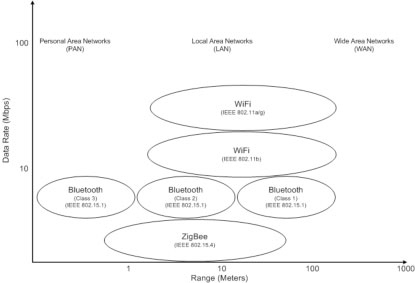 Wireless sensor networks are different from traditional wireless ad-hoc networks. Ad-hoc networks are designed to be created “on the fly” with any number of unknown nodes and are typically used for data transfer between any of the nodes. Wireless sensor networks are typically deployed with a known number of nodes, with each of the nodes being known prior to network initialisation. The nodes usually don’t need to communicate with each other; the aim is usually to collate the data in a central location for analysis. Wireless sensor networks should be designed with these things in mind, to ensure optimum network performance. Wireless sensor networks can have a number of configurations and are either designed to directly send data back to a fixed receiving node (single hop networks) or can adopt a mesh networking style topology where the data is routed back to a fixed receiving node via multiple mobile sensor nodes (multi-hop network). Single hop wireless sensor networks are typically easier to set up and maintain, however they limit the range of the wireless sensor network to a single radio link. Multi-hop networks have the provision for a greater number of sensor nodes and allow greater sensing ranges to be achieved, but are much more complicated to implement. Routing nodes in a multi-hop network can find a new path if an individual node drops out. Configuration, such as limiting the number of routing nodes, multiple redundancies and reducing network overhead such as re-configuration time are important considerations. There are essentially two approaches to implementing a wireless network. Utilising an off the shelf existing wireless protocol solution or custom design a wireless protocol for the specific application. Existing protocols reduce the development time of a wireless sensor network considerably and more time can be dedicated to analysis of the retrieved data, however custom design can create a more specific and hence better overall solution. Given project lifespan for many research endeavours it is likely that any chosen technology will be updated and out of date or obsolete by the time any working network is complete. This is an important consideration when choosing to back either a stable technology from a well known manufacturer or go with cutting edge technology from a small start-up company, wether to design your own protocol and have to repeat the process regularly or go with something existing that will continue to be developed by manufacturers. Existing wireless protocols can again be broken up into two different categories; global standards ratified to a standards body and proprietary wireless networks implemented by a single company. 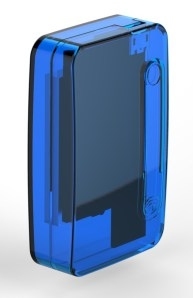 The risk of using proprietary radio standards to implement a wireless sensor network solution is that support and supply of radios can be limited as only one company produces them. The ratified standards are passed by members from many companies which ensure that the specification is robust and usually ensures that many vendor options are available.